HI well it's been a while since the red sea max nano has been updated on the forum. Back in April this year all went well with the cycle and all through the summer and the last 7 months the nano is now complete . I decided to have a mix of lps and zoas with maybe one or 2 sps .All has gone to plan with all the various corals settled in well. The only one glitch I had was I introduced some aphasia which I removed with aptasia x and only get the occasional one . So hopefully this first attempt of a nano will live up to my expectations So far so good . Hi - great looking tank. I’m really interested in the Red Sea Max Nano. Did you stick with the original kit or have you upgraded it? The only things I have added to the nano is 2 circulation pumps at right angles apart from that as out of the box. That’s ok! Thanks for getting back to me. I’m seriously tempted... I’ve had a little freshwater 40 litre tank for a while now and I’ve spent months browsing reef forums and watching the BRS 52 week series. I love the look of the RSM and the ‘plug and play’ aspect is really appealing. 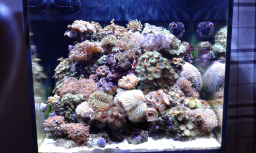 I’d plan to start super slow and probably stick to soft corals to make life easier on myself. I may bite the bullet and go for it! The a1 prime lighting will give you opportunity to keep soft/lps/and some hardy sps . It looks absolutely amazing! It’s such a beautiful tank. Thanks for the advice and will definitely let you know if I take the plunge - and thanks so much for answering my questions, I really appreciate it. out of interest... what are you dosing with?